The Honourable Thabo Mbeki, Past President of the Republic of South Africa; The Florean Museum of Romania, The Achenbach Collection, Fine Arts Museum of SF; The Library of Congress, El Museo Etnohistórico de Artesanías del Ecuador, The Oakland Museum, Amherst College, Brown University, Reed College, Swarthmore College, Cal Poly San Luis Obispo, UCLA, University of California San Diego, University of California Santa Barbara, University of Miami, University of Michigan, University of New Mexico, University of Oregon, University of Pittsburgh, University of Utah, University of Washington, Yale University, The Book Club of California, The New York Public Library, The San Francisco Public Library. Cathy has a Ph.D in Organization Development. She worked in this field for 18 years with large corporations and several universities. Her art work is exhibited and sold internationally. Cathy has been teaching and mentoring students since 1969. She lives both in Ashland, Oregon and San Francisco, creating art and doing strategic planing with arts organizations, including the San Francisco Center For the Book. Jubilation Press, located in Ashland, Oregon, is an independent letterpress printing company that focuses on poetry broadsides and artist books. Poet Derek Pyle and artist Cathy DeForest select poetry and prose that creates meaning in people's lives by providing inspiration and encouraging reflection. Derek and Cathy print on Jubilation Press' antique Vandercook cylinder printing press. Letterpress printing dates back to 14th century Europe, and is in itself an art form. Every part of the process is intentional, and each piece becomes a work of art– reflecting the care and attention that drives the technique. Jubilation Press has produced broadsides with National Poet Laureates Robert Pinsky and Ted Kooser, Zen master and peace activist Thich Nhat Hanh, and poets Li-Young Lee, Alberto Rios, Derek Pyle and others. Recent collaborations include work with Friends of William Stafford and California's Poet Laureate, Juan Felipe Herrera. Jubilation Press' primary goal is to spread poetic inspiration and artistic beauty, while keeping broadsides affordable with prices ranging from $10-75. Jubilation Press is dedicated to raising money for various causes. The letterpress broadside, "Dumpster Meditation" was chosen as the poem to raise money for the Welcome Home Project, a project that was designed to help re-integrate and welcome Iraqi and Afghanistan veterans home. "The Call of the Village" was written and designed to raise money for micro loans for women in Malawi, Africa. Jubilation Press moved from the Railroad District of Ashland to a Tuscan farmhouse outside of Ashland. Cathy's Universal I Vandercook press has a special name, which is Universal Grace. Visits to Jubilation Press and Universal Grace can be arranged by appointment. Cathy's book, Ink and Blood, is featured with 50 other artists' books at the American University in Cairo, Egypt. On March 5, 2007, a car bomb exploded on al-Mutanabbi Street in Baghdad, the historic center of the city's literary and intellectual community, named for the famed tenth century Arab poet. This street has been the haven for booksellers and book lovers since ancient scribes created beautiful books as early as the ninth century. More than a hundred people were wounded in the bombing; thirty were killed. The Al-Mutanabbi Street Starts Here Project, started by Beau Beausoleil, is both a lament and a commemoration of the singular power of words, seeking to make visible the literary bridge that connects us all across continents, across cultures and the passage of time. It asks what it means to erase culture, and provide a visible starting place for collective grief and aspirations for a more just society. 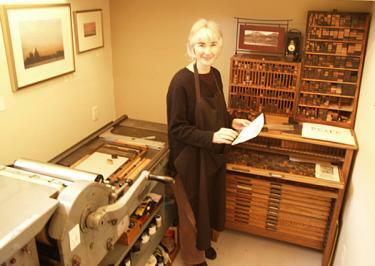 Cathy started her blog in 2009 when she and Mary Laird taught letterpress printing and artists' books at Santa Reparata International Art School in Florence, Italy. Since that time, she has featured book artists, letterpress printers, and poetry. To read her blog or sign up for the blog, please click on cathydeforest@blogspot.com. Gallery DeForest, previously located in Ashland's Historic Railroad District, maintained a strong presence in the Ashland art scene. Voted "Best New Gallery" in its first year of business, many sought out it's charm and beauty–making it a regular destination for both visitors and locals alike. Representing both local and internationally renowned artists, Gallery DeForest provided its clientele with a "visual sanctuary"–a space resonant with beauty, and an atmosphere calm and reflective. Artist/owner Cathy DeForest transitioned from operating a physical gallery into cultivating a virtual gallery. She shifted her focus to pursue her true passion– creating art. Since that time, Cathy's work has been widely exhibited and collected internationally.